Show what a hopeless romantic you are. Have this perfect pastel bouquet of delicate pink and purple blossoms sent to that special someone, and your poetic spirit will shine through! 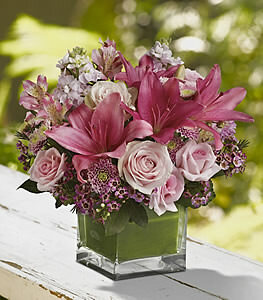 A mix of fresh pink and purple flowers such as roses, Asiatic lilies, stock and button spray mums is delivered in a glass cube vase lined with a green leaf.